Discussion in 'Ad Campaigns' started by lucy92, Feb 25, 2009.
i think the eyewear itself is ugly. the glasses are indeed ugly but the shot itself is quite nice. Love the soft lighting. The glasses are awful, but I think they work in that shot. 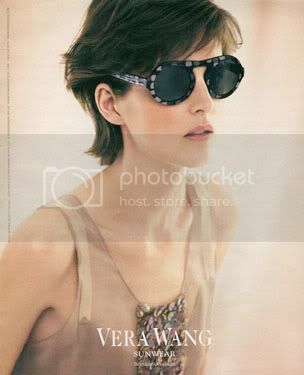 Oh God.......Vera stop with Stella in your ads, you can do beautiful clothes (even though these glasses are terrible), so why have her in your ads all the time ? I love the softness too, and glasses definitely don't fit in it. The eyewear industry is pretty saturated now and almost every design known to man has probably been made. And with the Luxottica and Safilo manufacturing almost every major eyewear brand, you can't help but expect the designs to start looking alike. They probably think they have to come out with odd-looking eyewear just to catch people's attention. I did notice that there are a lot of extremely weird, almost (if not totally) unwearable shapes now, most gearing towards either very angular (this I don't mind, they're quite interesting) or very round shapes (my theory is it's because of the re-emergence of the Ray-Ban clubmasters). Is the brand only doing eyewear ads this season? I loved the F/W 2008 ones starring Stella. I think it's simple, yet gorgeous. True, the glasses are ugly, but there's this simplicity that I just love to see in ads. HEY! At least it's not as bad as Dolce & Gabbana!